You use a fingerprint to access your smartphone, an access card to enter your place of work, and the last four digits of your Social Security number to verify you are who you say you are. But can any of these things really determine your identity? Not really, according to a new Defense Department guidance document. Many of you have heard of “joint operations,” “information operations,” and “intelligence collection activities” when it comes to the world of defense and national security. Well, let me introduce you to the Pentagon’s latest buzz phrase–Identity Activities. What does all of this psychobabble really mean? Well, it means the Pentagon wants to employ data analysis tools that will leverage biographical, biological, behavioral, and reputational data inputs to help the military determine the identity of a person they encounter on the battlefield and whether that person poses any kind of threat. Biographical: Name, address, passport number, tax records, etc…. Biological: Fingerprints, facial images, iris images, DNA, etc…. Behavioral: Cellphone records, social media, travel patterns, etc…. Reputational: Statements attesting or vouching for character, criminal records, credit scores, security clearances, organizational position, etc…. 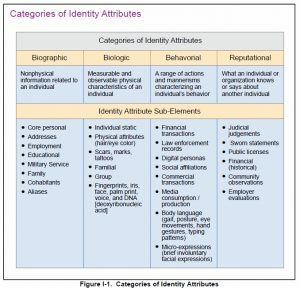 Second only to the expanded categories and subcategories of identity attributes is the number of databases maintained at the Federal level that are dedicated to one or more methods of tracking identities. DOD Automated Biometric Identification System (ABIS). National DNA Index System (NDIS) and Joint Federal Agencies Intelligence DNA Database (JFAIDD). Biometric Identity Intelligence Resource (BI2R). FBI’s Next Generation Identification (NGI). Department of Homeland Security (DHS) Automated Biometric Identification System (IDENT). Terrorist Identities Datamart Environment (TIDE).